Oh baby, when DC comics announced last year that characters from Hanna-Barbera would meet DC characters, the one that excited me the most was this issue. I’m only twenty seven years old, but I would rewatch Space Ghost on syndication whenever it was on, as a little kid Space Ghost was my favorite superhero. I’m not super protective of Space Ghost, so in terms of characterization Christopher Sebela and James Tynion IV in my eyes have more freedom with Space Ghost than his counterpart Hal Jordan. Will this issue make me nostalgic for my cartoons of old? Or will it make me regret reading this issue? Warning there will be spoilers going forward, you’ve been warned. First off I have to get this out of the way, but I am not a fan of Ariel Olivetti’s art at all. I’m not saying it’s bad (because on a technical level it’s actually really good), but his style is something that doesn’t resonate with me. Olivetti’s art shines during action sequences, one in particular is the first battle between Hal and Space Ghost. Using the double page splash in a unique way that not only delivers the impact that’s needed for a double page splash, but the narrative doesn’t suffer for it. When it’s just two or more characters talking then the art becomes stiff and lifeless, the facial expressions won’t even change. If you’re a fan of Ariel Olivetti’s art then you’re going to like the art for the issue bottom line. On the surface the story seems to be a simple crossover between two heroes of different dimensions and there are aspects of that, but Christopher Sebela and James Tynion IV put a little more depth into the situation that our heroes find themselves in. From my understanding this story was about ignorance and what can happen when said ignorance dominates a society, kinda like how a certain US president cries fake news when he hears something he doesn’t like. That analogy worked until Hal acknowledges current events with Space Ghost, thereby in my eyes makes the impact of what was shown seem less. When it comes to stories like this one, I tend to gauge how much fan service there is and for my money there could have sneaked in a few more references, but the ones that are there should be enough to satisfy any fan of either series, especially when you see Space Ghost handled a Green Lantern ring and actually struggling to use it. 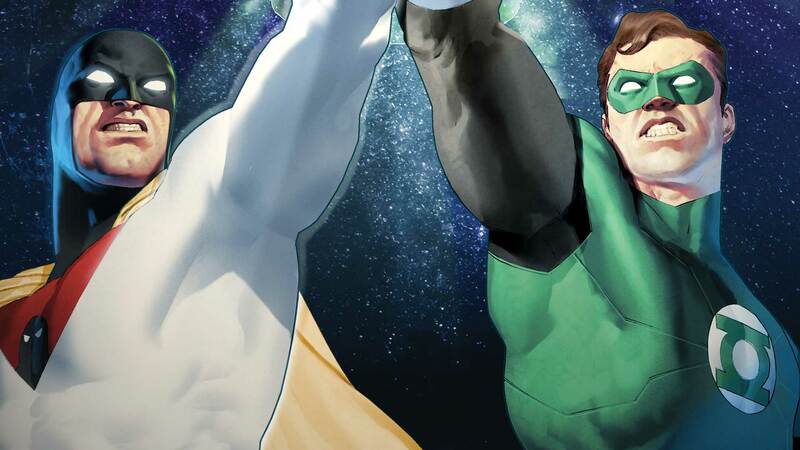 Green Lantern/Space Ghost gave almost gave me enough of what I wanted, I wasn’t a big fan of the art, but I can appreciate good storytelling when it’s right in front of me. If you’re a fan of either characters, do yourself a favor and pick this issue up as well.